Smoking is strictly prohibited in the condo or on the condo lanai. Doing so will result in full loss of security deposit at a minimum and could result in charges in excess of the deposit to remove the smoke from the unit The entire complex is a No Smoking area. Do not smoke anywhere on the Kanaloa property. Overall, we enjoyed our stay at this condo very much. The major positives are that the unit is spacious; the condo complex has beautiful grounds (great gardening, and it's oceanfront, though the unit itself is not immediately on the ocean) and great amenities; the kitchen was well-supplied with cookware, appliances, and utensils; and overall it was just an easy, comfortable place to stay. I enjoyed the provided snorkeling gear, and there are some great snorkeling spots nearby: Kahalu'u Bay is just a little bit north, reachable by walking along the coast (a bit rough in spots) or with a very short drive, and "Two Step," right by the Pu`uhonua O Hōnaunau National Historical Park (aka Place of Refuge) isn't far down the coast in the other direction. There was plenty of beach gear provided, in general, which is always nice so you don't have to worry about bringing or renting any. I cooked several meals there, and the kitchen was great. The cookware and utensils are a bit old / cheap, but they work well enough. The condo complex has grills available for use, too. There is a KTA supermarket extremely close to the complex, and its prices seemed reasonable (for Hawaii). It was nice to be able to pick up some fresh Ahi tuna from the supermarket, make a simple marinade for it, and have great grilled Ahi steaks right in our condo for *so much* less than at a restaurant. But if you're looking at condo reviews, I guess you might already be sold on that aspect... The unit itself is a bit dated in terms of its finishes and furnishings, if you care about that sort of thing. We didn't. My wife and I enjoyed our stay at a 1 bedroom condo. Kanaloa at Kona is in a great location along the beach on the south side of Kona. Easy driving to Kailua shopping and dinning district. The condos had all needed supplies to cook and barbecue at the condos. BBQ grill throughout the complex 3 pools and hot tubs. WasherDryer in unit balcony’s with lounge chairs and dinning tables. It was perfect. The owner also had snorkeling gear at the condo with body boards for surfing. I know they have 2 and 3 bedroom condos. I would highly recommend this place to all our family and friends. Aloha!!! Amazing location and excellent condo. Aloha, If you're looking for a great place to stay on the Big Island this is it. This was our second trip back to Kanaloa at Kona and my wife and I can't wait to return next year. The condo was amazing and had everything we needed for our stay. Each morning we'd enjoy our coffee and breakfast on the deck and in the afternoons, when we weren't touring the island, we could be found out by the pool chatting with other guest. Close to downtown Kona, the short drive into town is convenient for shopping, lunch, dinner or a swim off Kailua Kona Pier, where each year amazing athletes competes in the world's most prestigious Ironman. In addition, if you and your family enjoy snorkeling, Kanaloa at Kona is conveniently located to some of the best. Again, we are looking forward to visiting Kanaloa at Kona during our next trip to Hawaii, and if condo 1203 is available that's exactly where my wife and I will be heading. We rent condos so we can "live" while on the island. We like to spend time in, cook our meals, and feel "at home". The condo had the bare essentials for a stay, but could stand to be updated to accommodate a more comfortable living situation. Small things like mixing bowls, storage containers (considering things need to be kept airtight to avoid pests), a mixer, toaster oven that works, etc. That being said, it was clean and private. It was a nice size space for two. We enjoyed our stay and love the complex. We've stayed in Kanaloa several times and are always impressed by the way the grounds and pools are kept so clean. We will be planning another trip to this destination, but probably not this condo. Overall, the condo had everything that my wife and I needed on our vacation to the Big Island. The location also served us well. The review is not a 5-start because the condo decor was very dated, the amenities were adequate, the toilet had issues with not flushing properly (the water to it was shut off when we arrived), the cable did not work, and air did not flow well between rooms in the condo. If you are looking for only a place to eat breakfast or the occasional meal and to sleep, this is a good condo for the price. Recently spent 5 nights in this condo. The facility and the condo seemed to have been built in either the late 70s or mid 80s, which seems to be the same as all condos in the area. 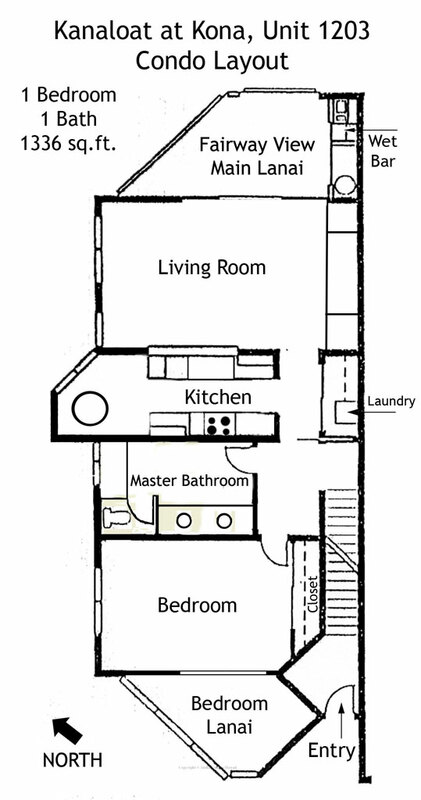 The bedroom and the living room are on the same floor with a bathroom in between. The bedroom lanai looks over the parking lot, with a very small oceanview. The lanai off of the living room overlooks a golf course. Air conditioning was nice and needed in the July humidity. The condo is well stocked but could use some updating in appliances and general upkeep. Toilet water was turned off when we arrived so we had to turn it on ourselves. The paint was chipped in areas and wood cabinets were in serious need of oiling. Fruit flies were coming out of the garbage disposal. We had a smoke detector start chirping at 4AM, but we called the local caretaker and they replaced it a few days later. Overall it was a great value for our stay, but overall the condo could use some simple updates and upkeep. We spent a wonderful week in Kona often going far afield, but some days just hanging the Condo. The Condo faced the golf course and was super peaceful with sun on the lanai in the morning and we could still hear the waves at night. It was well equipped with beach chairs and towels and plenty of kitchen basics and equipment. Mark was very responsive and helpful. We stayed our first 3 nights in Volcano but with all the volcano activity starting just before we left, we weren't sure that would be feasible. Mark was wonderfully flexible and willing to have the condo ready for us early if that proved to be necessary. We loved the location and the Kanaloa... more peaceful than the condos closer to town, but close enough for a short drive to town when we wanted to go there or to Magic Sands beach for a swim before breakfast or great snorkeling at Kahalu'u Beach Park. We're frequent visitors to the Hawaiian Islands, but this was the first time we elected to stay in a location other than a hotel. What a great decision! If you have young children (4-10yrs), this is a great place that has three pools on site, beaches for swimming, snorkeling, and lounging nearby, and Manta Ray watching at night (right across the nearby bay - walk or drive). The condo is clean and comfortable with everything you need. We loved the community BBQ and pool areas where we met a wide variety of people from Canada to the Netherlands. Everyone is friendly and the complex is well kept. While the condo finishes may not be new, everything works just fine. And if the balmy Kona winds keep you up at night, you can opt for A/c for a tad extra per night. We would definitely recommend the place and we would stay here again. We enjoyed our stay in Kanaloa 1203.We’ll appointed, great location, amenities & super stocked. Complex clean and easily accessible. People friendly & would recommend as well as stay here again. Nice Condo with a Comfy King Size Bed! Pros: Located in a nice community with 24 hour security, 3 pools, and a sunset to die for which you can watch from the "Ocean Pool". Shopping center and a few bars located within 1 mile driving. The condo itself was well equipped with the basic necessity's including beach towels, chairs and kids toys for the beach. Washer and dryer in the condo was a big plus! The kingsize bed was extremely comfortable. Plenty of space inside. Cons: bathroom and kitchen were outdated, but not a big deal. We also had a good amount of luggage since we were staying in Hawaii for 11 days. It got exhausting carrying the bags up and down the stairs....the condo is a ground floor entry, with living space on the 2nd floor. Overall, I would come back and stay here and recommend to my friends. We really enjoyed spending 17 days in this condo. The unit is very well maintained. Has all the amenities needed. The bedroom faces west and you can hear the ocean. King size bed is very comfortable. Great location and the grounds are beautful and well maintained. Mark, the owner, is a pleasure to deal with. And we are thankful that he allowed us to stay in his condo. We will definitely return!Mahalo & Aloha. I have stayed at Kanaloa at Kona complex many times. It is well kept and quiet. Just a few miles from Kailua and there is a shopping mall right up the hill for many of your needs. Was the first time staying in condo 1203. This condo is quite large as condos go on Hawaii, lots of room. It is well equipped with almost anything you will need for your visit including all the beach items you will need, i.e. chairs, boogie boards. It has a nice patio in back out of the sun and one off the bedroom. Check in/out info was easy to understand and execute. I will definately book this condo on a future visit to the Big Island. This apartment was perfect for my husband and me for our 35th wedding anniversary. We had stayed in the complex 17 years ago on vacation, and had fond memories of it from that trip. We were delighted to see that the apartments are still very well maintained, the grounds immaculate, and the conveniences such as the Keahou Shopping Center still as easy to get to as ever! This unit was perfect. It was quiet, had lovely views of the golf course and a peek at the ocean, and was easy to get into and out of. It had everything we needed to cook all our meals, do our laundry, surf the Web, and live just as we do at home. We had plenty of space for both of us to spread out, lounge around, and relax. And the location cannot be beat! We spent time going up and down and across the island - Kailua is a perfect spot to head in any direction. We also took advantage of the manta ray snorkeling tour that can be arranged almost right around the corner, as well as the Sheraton's evening cocktail hour at sunset. We LOVE this place, and we will return! Mahalo for making the first week of our Hawai'i anniversary adventure so memorable! Another great 2 week stay at Kanoloa Condos. We stayed in Mark's one bedroom unit this time. Great unit with lots of living space. The AC was great to have in Aug-Sept months here in Kona. Mark was extremely responsive to a couple of minor needs that we had. I highly recommend unit 1203. We'll be back to Kanoloa for three weeks in December. My wife and I stayed at this condo for ten days in July 17. We had a pleasant and enjoyable stay in this condo. Absolutely quite, spacious, very well provisioned, everything we needed was there. We like to cook our meals, and we felt like at home in this condo.Everything went through without a glitch, we were much happy with our choice. The condo location is really convenient for visiting the island, and has pretty nice snorkeling at walking distance. There is a black gravel beach close by, from which I was able to swim up to the Sheraton across the bay, and meet face to face with a manta ray (and a couple of gray snappers) there.Best cost/performance apartment we could find in Kona.Highly recommended. My husband and I stayed at Kanaloa at Kona after long days hiking at the volcano. The resort is lovely with well tended plants, pools and outdoor bbq stations. Our condo had a lovely view to the golf course and hills behind. The condo was well equipped (including beach towels, chairs, etc. etc.) and very comfortable. So easy and pleasant that we chose not to go to restaurants but bought quick meals at the local store - also close by - and sit on the veranda and enjoy the evenings. for us, the condo was perfect even if the weather wasn't. We have been coming to Hawaii Island for many years and have always stayed at a condo at the Kanaloa. This condo (1203)was great! Excellent location in the complex, quiet, and the interior was very clean and well equipped. The owner was amazing during our crazy switch of rental dates and we are forever grateful! Thank you for that!Looking forward to visiting again next year! What a wonderful place. I have stayed in over 40 different condos during the last twenty years, but this one is the largest and most comfortable of them all. It is peacefully located between a golf course and the ocean. We love to snorkel, so we divided our time between Kahaluu and Keauhou Bays. The unit has everything we needed and is very clean. The larger of the two lanais is very large and overlooks the golf course. Every morning I sat at the large table and watched the birds and the mongooses romping around on the grass. This is a quiet gated community well below the Keauhou Shopping Center with three swimming pools. We stayed 18 days and had a great time. Great condo! Very clean, well-appointed, and quiet. Loved the private lanai off the living room, overlooking the golf course. Mark was wonderful to deal with and we will certainly stay here again. My wife and I spent an enjoyable 8 days at this condo. The unit is tastefully decorated and has a nice view of the golf course. You wake up to the sounds of birds and fall asleep to the sound of the ocean. Mark was great to deal with and we had the pleasure of meeting him during our stay. We definitely plan on returning to this unit our next time in Kona. The best thing about the condo is unquestionably the location. It's not right on the water (which can get a little wild in the winter when the waves get really, big, as they did while we were there), but it's got a lovely, peaceful view between the palm trees, over the golf course and across the flank of Mauna Loa from the lanai, and it's close enough that we could lie in bed and listen to the waves every night. The complex is very nice and totally safe, and it is right on the Kona coast just a ten minute walk from Keauhou Bay. The grocery store and several good restaurants are a two-minute drive up hill, and you're within easy driving distance of all the amazing attractions on half the Big Island. We even made it to Volcano National Park this time and got to see Pele in action! I found the bed to be a bit hard, but some people like a firmer mattress. We didn't need the AC or heat, it was just right the entire time. It was hard to leave when it came time to come home! A very spacious, clean and fully furnished condo. We had everything we had hoped for and more in the condo during our stay. Practical, well maintained condo at a great location! I stayed at Condo 1203 in Sep 2016, and I had an awesome time here.First of, the condo was impeccably maintained - it has everything you need.Kitchen is well equipped - worked great for the 2 of us. I cooked every chance I got.Washer + dryer in unit - this was a lifesaver. Can't live without this.2 sink bathroom - no more bathroom bottlenecks!TV in the roomWe did not pay extra for the A/C, it was ok with the windows open and fan on.Additionally, the unit was stocked with snorkel equipment, swimming boards, chairs, bags, etc. Everything you need to have fun in the sun. Don't think twice. This condo is professionally managed, well maintained, and well priced. The Condo is great for two people. It is spacious and well equipped. The main lanai (there are two, another is off the bedroom) overlooks the 11th fairway of the Kona Country Club. The two swimming pools are a short walk. The condo is as it is pictured. Wife and I have visited the islands many times (Oahu, Maui, Kauai, Molokai, Hawaii) because of having left Hawaii about 60 years ago, with many family members and school classmates still around, and fun/important to visit/connect with. But Kona is still the Kona of my youth, and I still sense its attraction in the colors, sounds, aina, and sunsets despite what feels like overpopulation and too many buildings. Yet its beauty is self-evident. And the placement of your condo is part of that. The setting is pleasant, feels peaceful, and loved the presence of the many palms, trees, shrubs and colors. Anyway, thank you for the easy use of your condo, staffed by friendly people (every person I had contact with!). When my husband and I were planning our trip, we decided to try out a condo rental, we wanted a different expierence from the usual hotel stay. I am so glad we did! Aloha condos is located right below Ali'i Drive (which we took advantage of and ran every morning before starting the day), the condo area is beautiful and well kept. We rented a jeep and our parking spot was right next to the condo we were staying at. At our arrival, I noticed the place had a vintage Hawaiian feel to it, which was nice. Everything was well kept and clean. The owner was organized in the matter of having contact numbers and emergency information accessible in detailed manner (grounds keeper, etc...). We enjoyed all the amenities the condo had which included beach chairs, umbrellas, body boards, etc... The best part was the washer and dryer, which we used daily and we didn't have to come back home needing to wash all the dirty clothes. It even had laundry detergent & laundry sheets! The bedroom was spacious, lots of closet space, large outdoor patios outside the bedroom & living room. The tv had remotes, the shower was also spacious, equipped with shampoo, conditioner and body wash. Even though we didn't use them, it was nice to see how thoughtful the owner was. The kitchen had all cooking necessities. I highly recommend this condo for a couple that wants to stay in a peaceful and secure place. I had peace of mind knowing that at the end of the day, I was going 'home' to a quiet place without the hustle & bustle like the hotels tend to be. The only reason I didn't give this condo 5 stars, was because I noticed the ceiling fans weren't clean. However, there was no need to turn them on because the air conditioner worked wonderfully! There's one in the bedroom & living room. The owner was easy to work with since the beginning. He responded to my email quickly and never hesitated with whatever concerns I had. We thoroughly enjoyed our Condo. I only had one negative comment. It was very dark on the stairs and my 88 year old mom had difficulties with that.The condo was clean and the bed was comfortable. It was also very quiet. We never heard people around us.We booked a tour around the island at the office and my mom loved that.I would stay here again and would love to come back when we don't have a wedding! Everything was greatly arranged and we enjoyed staying at 1203.But when we were there, air conditioning is not properly work.We requested to maintenance team to check, it was found that freon gas wasnot enough.The gas was refilled and it works good.Before we arrive, it should be maintained we guess.Thank you. My wife and I had a wonderful time. When they say "time flies when you're having fun," that's an understatement! The location could not have been better. The price was great and the condo was perfect. The grounds were very well kept and the oceanside pool was incredible. My wife especially liked taking walks along the ocean after swimming in the pool. We met two other couples there and traveled all over the island from beach, to desert, to rain forest and volcanos. The best part was sitting on the lanai and talking about the day's adventures. We can't wait to return! A well equipped and well located spacious unit with every amenity possible. Great mountain and golf course views. An ideal retreat. The condo is in excellent shape, well maintained. The owner responded promptly to questions. The condo complex is quiet and well run. This area of Kona is great for snorkeling and walking, and is not heavily commercialized. South on Highway 11 there are lots of places to explore, and a 2.5 hour drive to the volcano. This was our second time renting a condo through Aloha Condos. We love how easy their process is from selecting the condo to making the reservation to accessing the condo when we get there. This condo was extremely quiet and we enjoyed the private lanai and beautiful view. It had everything we needed from a well-stocked kitchen, Big Island guidebooks and recommendations for activities and restaurants, to beach supplies such as towels and chairs. We thoroughly enjoyed our stay. The only reason for the 4 star instead of 5 star rating were a few maintenance issues: the a/c unit in the bedroom wasn't working and wouldn't be fixed until after our stay, it was warm but not unbearable, but a little dissapointing as we had paid the additional fee for a/c; the bulbs in the table lamps in the living room were burnt out, not a huge deal but we are readers so it would have been nice if they'd been maintained. That said, we felt the condo was a very good value and overall enjoyed our stay and would stay here again. Very good location and a great complex. It was pretty quiet in September, so we had three pools, tennis courts and all other amenities to ourselves. Condo had a good layout which fitted my wife, a baby and myself. Also the owner is very responsive and helpful. I left my car keys in a condo (bummer). After I had realized in a parking lot in Seattle, they were immediately mailed to me with express mail! Great location and amenities. The personal extras such as beach chairs, boogie boards, etc. are a real plus! Smoother checking in/out than any hotel. Check out the binder on the living room table and the Hawaii revealed book, tells you everything you need to know about the condo and the big island. Overall, we enjoyed our stay at this condo very much. The major positives are that the unit is spacious; the condo complex has beautiful grounds (great gardening, and it's oceanfront, though the unit itself is not immediately on the ocean) and great amenities; the kitchen was well-supplied with cookware, appliances, and utensils; and overall it was just an easy, comfortable place to stay. I enjoyed the provided snorkeling gear, and there are some great snorkeling spots nearby: Kahalu'u Bay is just a little bit north, reachable by walking along the coast (a bit rough in spots) or with a very short drive, and "Two Step," right by the Pu`uhonua O Hōnaunau National Historical Park (aka Place of Refuge) isn't far down the coast in the other direction. There was plenty of beach gear provided, in general, which is always nice so you don't have to worry about bringing or renting any. The unit itself is a bit dated in terms of its finishes and furnishings, if you care about that sort of thing. We didn't. The usint was ready before listed check in which made our travel day much more easy. The unit was clean and had every amentity needed for a fun time in Kona including, tennis rackets and balls, beach umbrella and towels. There are 2 books on the coffee table that really helped us plan our adventures. Full working high and I do mean high speed internet access. An awesome Balcony over looking coconut treesand a gold course fairway. The pools on site were ideal and the grounds were landscaped with beautiful tropical flowers. I could go on and on but just take our ord for it, if you are looking for an intimate 1 bedroom condo for a romantic getaway to hawaii for 2 look no further just pick this unit and enjoy planning the rest of your vacation!!! We found this condo to be clean and comfortable during our stay. Having the air conditioning and washer/dryer was very useful. The kitchen is of an older style but still very functional, with good selection of cooking tools and dinnerware. The bedroom with king bed is large with plenty of room for moving around and storage. The shower had less water-pressure than we'd like, but still worked. Overall the entire unit is spacious for a couple to be very comfortable during an extended stay.The adult pool is within short walking distance and was nice to utilize for quiet and relaxation. The ocean pool has a great view, however it can be crowded with families and a bit noisy.The booking process through aloha Condos was simple. The unit owner was very easy to contact before and during our stay. He was very reasonable to work with and we appreciated his consideration and effiency in providing all the information we would need for check-in. The area itself is quiet and only a 10-15 min drive from main Kailua-Kona hustle-bustle. Grocery shopping, and a couple of good restaurants (Royal Thai, and Sam Choy's) are conveniently just up the hill.Overall, a good experience. A good base camp to explore the Kona side of the island. I have stayed in many condos at Kanaloa, and was very pleased with this choice. This condo is located close to all the pools, and on the cooler, golf course, side of the complex. It is very well maintained and the housekeepers should be commended for how clean it was. Don't let the lower price fool you, this is a comfortable roomy condo in a quiet location and nicer than some you will pay more for. Great value. Older condo but clean, roomy, & well kept. Complete with all amenities including precious aC & Wifi. Not knowing Kona, I was unsure about the golf course location thinking it would be in the middle of nowhere, but it's a perfect location - only 5 minutes from downtown and our new favorite beach (Magic Sands). Nicely quiet - ate breakfast on the patio in peace listening to birds everyday. Very impressed with how stocked condo was with everything from sporting goods to a full spice rack - others don't even have salt & pepper! We are grateful Mark for a comfortable accommodation in his wonderful, well- designed and well-equipped condo. We spent such a great time in the beautiful and quiet place. We wish we could stay longer there. We come back again! Conveniently located to sites, beaches, pools, golfing & shopping, Quiet, relaxing & comfortable with all the amenities of home. Loved the lanai and the ocean front pool. We chose this place based on reviews and were not disappointed in the least. Definitely would recommend to friends and family. Great vacation place - spacious condo with a well equipped kitchen. Immaculate grounds, a choice of 3 pools so if you want quiet, it is no problem. A short distance to restaurants, grocery stores, markets etc. It is a great place to rest and rejuvenate in between activities. We stayed at this condo for only 3 nights but wished we would have been here the entire 10 days of our vacation. I loved all the extras it came with especially beach stuff. It really felt like home since we didnt have to go out and buy anything other than groceries. We cooked everynight and got to enjoy our last three days in Hawaii just relaxing. Also, it was so quiet we over slept every morning.. The condo was spacious, well decorated and appointed, and the location was great. We enjoyed a quiet vacation in a comfortable spot. The rental process and subsequent correspondence was easy and helpful. We loved the condo 1203!! It was spacious and clean and had everything we could possibly need for our stay! the bedroom faced out to the ocean so you could hear the waves at night and the lanai off the living room faced out to the golf coarse which was beautiful and serene both for breakfast and for dinners! We used the BBQ across from the condo every night for dinner! The condo is in the perfect spot for exploring the island and was close to all amenities. We loved the community and looked forward to coming "home" at the end of each day. Clean and spacious condo. The Kanaloa resort is beautifully landscaped. Minutes from Kahaluu beach park which is one of the best snorkeling spots on the Big Island, with lots of turtles. We were winding down after a fairly hectic time in Maui, so this quiet condo was in the perfect setting. For families the keauhou shopping center is conveniently located nearby with groceries, restaurants etc. We reserved this place because it looked to be a very good value. We didn't want to pay for, nor did we expect, a plush resort accommodation, but this exceeded expectations. It is a very nice condo in a very nice complex. The condo has many amenities that give the feeling of home. The owner has provided a fully equipped kitchen including a variety of spices and cleaning supplies. Even the knives were very sharp which is highly unusual. The complex is very clean, quiet and with good security. I inadvertently opened my trunk from inside the condo and was surprised when security knocked on the door to inform me of the situation. We enjoyed the condo very much. It's located in a very convenient area that is close to many things and easy to drive to any location. The condo is supplied with all the necessities just like home. We felt so fortunate to have found such a nice place to stay. We had a wonderful time staying in this condo. It was centrally located and had everything we needed. After spending a long day visiting the green sand beach, black sand beach and volcano park it was great coming back to a place that felt like home. We are definitely going to recommend this condo to our friends and family. We will be staying here in the future!! clean & quiet & amenities +++! Mark provided excellent service. All emails were answered right away, directions to the condo were precise and everything was in order when we arrived (keys, code etc)The condo was clean and extremely well equipped with everything from kitchen to beach amenities. The view is over looking the golf course and we found it very calming and peaceful...not a clue what hole we overlooked. If one is up early the golf course makes for a lovely walk or run and, in the evening watching the spectacular sunsets. The only downside for me was not being close to a beach. The beach was within about a 10 min drive. This is a very nice condo. Plenty of room. Good facilities in the condo and resort. It is so relaxing sitting out on the lanai.The resort is well located. We would have no hesitation in staying there again. It's a very nice hawaii home to stay. The facility in the community is also very nice. The beach and shopping center is very near and nice. We have a lot of fun at alii Dr beach and store. We have a really great time there. I already recommanded my colleague to book this condo this early Dec. The condo is well equipped. Dishwasher, washing machine, dryer, beach chairs, etc.The cleanliness leaves much to be desired, however. The cooking utensils we had to rinse thoroughly times.The device is worn-out. A renovation is necessary.Here above all was easy. This home was filled with more then we expected, very clean, no bugs, safe for children, swimming gear, cooler made travel to hilo worth the drive and to pack drinks for the children. We didn't want to leave. Didn't have to puchase or bring many of the items we did traveling with children. I would stay in this condo as my altimate best Kona condo we've stayed in. Owner easy to work with and Kona staff by far the best. 10 star. I was looking for paradise and found it. My daughter (10yrs) and I left the boys home and came to your beautiful island. It was, by far, the most amazing vacation I've done. We snorkeled, surfed, paid homage to Pele at Kilauea caldera, hiked - a lot, visited the Hilo area waterfalls and discovered tide pools. None of these things would have been so greatly enhanced had we not had such a lovely 'home' to return to at the end of each day. The condo was beautiful, the staff was outstanding, we found ourselves continually impressed with each passing day. The only disappointment on this vacation was having to leave. We are planning our next vacation now and it is no surprise, it is on the Big Island. Mahalo, Mark and aloha Condo's staff. We will be back! This is a great place. It is very clean, modern and has almost all of the comforts of home. The kitchen is better stocked than most other vacation apartments that we've rented. In hindsight, a more complete list on the Web site of exactly what is here might be useful, as there were some things we brought that were already in the condo. It was a nice touch to have someone turn on the lights and the stereo softly for our arrival. It was very nice to have a washer and dryer. The stereo and TVs were in great working order, as advertised. We LOVED the automatic ice maker and little cooler. They were both very useful for packing drinks and keeping food cool for day trips. We also used the bamboo mats on the beach - much better than towels and better at keeping residual sand out of the condo. Another thing that we really appreciated was the binder on the coffee table with great info and the Hawaii Revealed Book. The adult pool is the only one we used and it was very clean and well maintained. We were a little disappointed the ocean pool was closed for renovations but c'est la vie. The only problem we had was mosquitoes in the bedroom at night. The screens on both sliding doors, as well as the one over the bed need a little adjustment and we were wakened by buzzing around our heads and had to get up and do a mosquito hunt. The proximity to all the necessary services is excellent. The staff, from the security gate to the grounds staff to the house cleaner were all very friendly and helpful. One night that we had to call security to remind some very noisy people out by the barbecue pit that quiet time was in effect at 10pm. The security people responded immediately and the noise stopped minutes after that call. Great service. We certainly recommend this facility. The bedroom screens have been replaced and repaired. The condo was a super deal, $640 total for 5 nights. We liked the fact that the owner included good quality snorkeling equipment for our benefit. The place was old and in need of renovation but clean. The pillows were quite cheap,hard and uncomfortable. Also, quite a bit of noise from the condo next to ours (ground floor unit) but obviously no reflection on our unit. Overall, excellent value for the money. The photos accurately reflected the interior so no surprises upon arrival. We really enjoyed our stay in this spacious, fully-equipped condo. The view over the golf course from the large lanai is very relaxing. We were close to Kona and there is a great shopping center very close by. We can't wait to return! A very pleasant place to stay with many amenities. We visit the islands often and enjoyed this condo, however we will look elsewhere next visit. The issue is with the refund policy. We reserved this condo less that 60 days before occupancy. Two days after completing our reservation we contacted the owner that we needed to lessen the stay from eight nights to seven. Since we were in the no refund range, we did not get a refund for that day. We understand the policy. We also understand how repeat business works. I stayed at Kanaloa complex on an earlier trip and really enjoyed the location and facilities. They have tennis courts, 3 pools (one that is for adults only, YEY!! ), near shopping and cinema, less than 2 miles from a great beach, Kanaluu. This trip we were looking for a smaller condo than last time and found condo #1203. The condo was awesome: Big, well supplied and appointed, clean, comfortable. We spent a wonderful week in Kona scuba diving, swimming in the pool and lounging around. The bed was super comfortable as well. The gentleman renting the condo was very kind and easy to work with. There is a good binder with all the information you need at the condo. I highly recommend this condo #1203 and complex. This is a really nice place so treat it well! We were only able to stay a couple of nights but enjoyed our time here. The condo was clean and we enjoyed walking out to the ocean where we were able to see sea turtles. Very relaxing and quiet location we will try to visit again. I would definitely recommend this property. We found it to be very quiet and relaxing. I would not hesitate to stay in the future. My wife and I visited the Big Island to see its sights, not lounge around the pool or beach all day, so we didn't want to pay several hundred $ per day for resort amenities that we wouldn't be using. We just wanted a clean place to sleep and shower...we were out the door by 8am every day. Kanaloa at Kona 1203 met that need very well. It is well-located, quiet and it has a pleasant lanai for early breakfast and coffee. My husband and I went to Hawaii in 2006 for 10 days. We visited three of the islands, although only for short stays. The Condo in Kona was our favorite. The location was perfect, view was great and Condo was very nice and comfortable. If we go back to Kona this condo will be my first choice. After booking the condo unit for my mother in law for a wedding in Kona, we had some extreme circumstances come up. The bride was diagnosed with breast cancer and was starting treatment immediately. With under a month to go we were forced to cancel the plans, I was treated with sympathy and gracious hospitality, as the booking agent offered to give my mother in law the room at a later date even though it was within a month. Later in the week the booking agent called back and happily left a message saying that they were able to book out the room and we would get a refund in full. We will definately stay there on our next visit to Kona and recommend it based on the Extreme Courtesy we received! We found this unit to be very clean, comfortable and well equipped. The view of the garden and golf course is beautiful and it's a very short walk to the beach. We selected this unit to save the cost of an ocean front unit and we were not disappointed. If we are ever priviledged to return to Kanaloa at Kona we would definately rent this unit if it is available. Rented this condo for 2 weeks but only stayed in it for one - not because of the condo but because of the VOG which was terrible at the time. We found the condo to be reasonably comfortable and quite well equipped although much of the outdoor equipment that the owner has left for guests to use was in poor condition. My wife complained that the condo was not very clean - I believe the word she used was "disgusting" - although I found it not bad myself. It could have used a good dusting and a little more attention in the closets and bathroom. The photos that the owner has posted represent the condo fairly. Outside, the grounds are nice and well maintained - we did not use the pools. The lanai furniture was a little scary - we placed towels over it before sitting down so our clothes wouldn't get dirty. The location is not bad - very close to a good shopping centre and to Kailua-Kona - and there is a nice, if short, shoreline path surrounding the property but no place for safe ocean entry. Overall, we give it a "just okay".